LEBANON, Ohio – June 3, 2014 – Doran Racing hopes to take care of some unfinished business this Saturday night at Kansas Speedway as the IMSA Continental Tire SportsCar Challenge Series stages its second race ever on the six-turn, 2.37-mile road course that twists through the infield of the 1.5-mile tri-oval in Kansas City, Kan.
Doran Racing will be duking it out in the Grand Sport class with a beautiful Nissan NISMO 370Z RC, #14, driven by Brad Jaeger of Charlottesville, Va., and B.J. Zacharias of Cincinnati. The road course was added to the facility during the summer of 2012, and held its first CTSCC race last August. Unfortunately the team dropped out of last year’s race after only 23 laps, but it led for 16 of those laps and it set the fifth-fastest lap of the race in the process. It was one of only nine cars that posted a lap in excess of 104 miles per hour during the race. 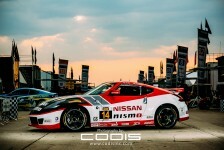 Zacharias and Bryan Heitkotter were co-driving the Doran Racing Nissan in last year’s race. Jaeger will be making his first start ever at the facility on Saturday. The two-hour-and-30-minute race is scheduled to start at 6:15 p.m. local time, 7:15 p.m. Eastern, and it’s sure to make for a hot Saturday night of racing action. Zacharias said he hopes that the series makes some additional technical rules adjustments to help even the field. “Last year things were really looking great for the 14 car at Kansas; the NASCAR Turns 3 and 4 really suited the Z. This year it seems that all the makes in the series have been given performance incentives, so it’s really an unknown at this time,” Zacharias said. “The Aston is lighter and has more RPMs. The Mustang is a touch lighter and lost its restrictor plate. The Fall Line BMWs are potent, and the new Camaro is just a whole different animal. We aren’t completely out of the picture for the championship yet, but I think it will require a performance boost from the series,” he said. The team will certainly do its best regardless, and with the driving talent of Jaeger and Zacharias; the organizing, mechanical and race-strategy skills of team owner Kevin Doran and the efforts of the hard-working Doran Racing pit crew, the team is always a contender. The schedule shows two one-hour practice sessions at 3:45 p.m. and 7:30 p.m. Eastern time on Friday followed by qualifying at 10:40 p.m. Eastern time that night. The race is scheduled to begin at 7:15 p.m. Eastern time on Saturday. 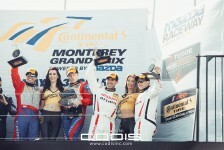 More information is available on imsa.com. It’s a busy month for the CTSCC series, as it also will appear at Watkins Glen International in Watkins Glen, N.Y. on June 26-28.